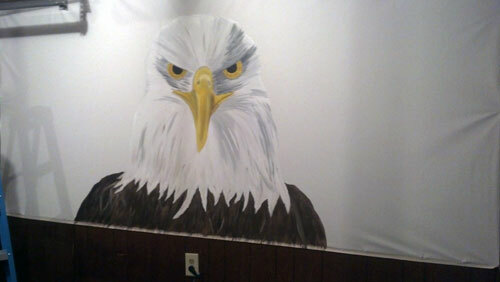 Ever decided to do something crazy like paint a picture on an entire wall? Well I did. And its not really crazy, as in bad. It’s crazy to want to blow up the 8×10 picture you painted to 5 foot by 9 foot. Thats pretty crazy. Repainting it on the garage wall is one way to enlarge a picture. Just in case we ever wanted to move the painting or move to a new house, I didn’t want to do it directly on the wall, so I bought a roll of canvas from a local art supply store. 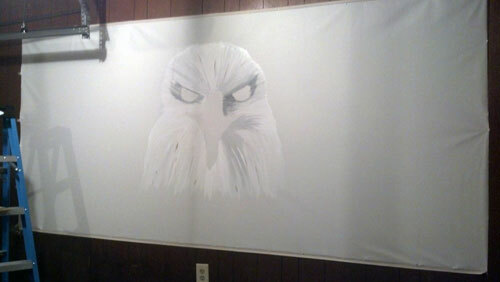 I somehow managed to hang the entire thing, by myself with some thumb tacks and a ladder. By the way, kittens do not help, when they continually try to climb the ladder when you step down. The sketch went pretty fast. 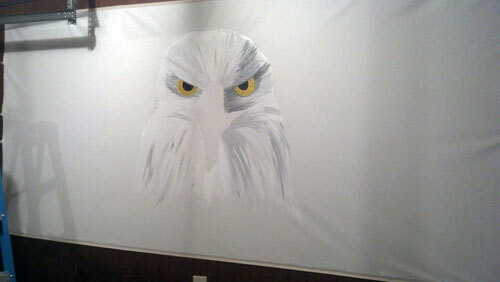 I hung the canvas and sketched it out all within an hour. I was expecting it to take a while and cause a good amount of frustration. Later that night, when my husband went to work, I got started! Turned up the radio, turned on the fan (yes, its December and I had to turn a fan on to paint a picture in the garage at midnight, crazy), pulled out the huge jars of paint and paint brushes and got to work. 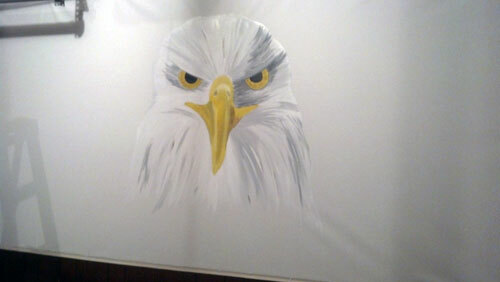 Within 2 hours I had the eagle pretty much done! When I go back, maybe there will be a few touch ups, but mostly its there. I decided to save the flag in the background for another day.